This Copycat Rice a Roni recipe is even better than the boxed version. Make it in the Instant Pot for a hands off quick, easy, and healthier side dish. This post may contain affiliate links, please read my full disclosure here. You ever have a random craving for a meal from your childhood? Happens to me quite often. I’ll be thinking of what to create in my kitchen and I’ll get a sudden urge for a dish I hadn’t had in years. That’s how it was when it came to this Rice a Roni. Even as an adult, I used to buy the flavored rice and pastas from the dried goods section of the supermarket. Once I realized that these things were full of sodium and other no no ingredients, I stopped buying them. As a matter of fact, I discovered that it was much easier and cheaper to make flavored rice out of ingredients I already had in my pantry. Hence this homemade copycat rice a roni was born. I recall the first time I made it to go along with a delicious steak dinner I made for hubby and myself. Apparently he used to eat rice a roni as a kid too and loved it. So I made this copycat rice a roni, plated it beside a delicious steak and asparagus dinner, and waited for the verdict. Initially, he thought it came from the box and he claimed I doctored it up somehow because it tasted so delicious. He was in shock when I told him it wasn’t from a box. As a matter of fact, he didn’t believe me, still doesn’t believe, and always looks in the trash for a rice a roni box as evidence when I make it. 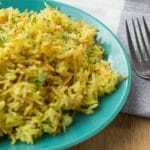 now and this copycat rice a roni is no different. 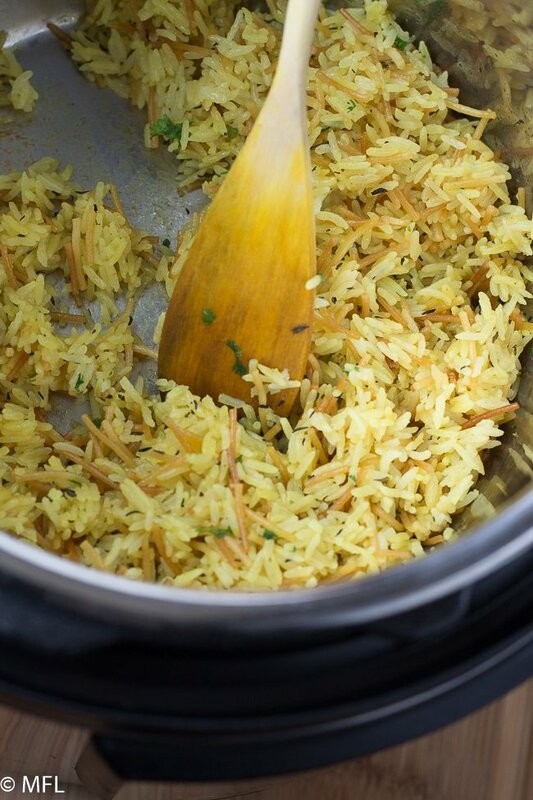 Reason being is that with the right ratio, rice cooked in the pressure cooker always comes out perfect. 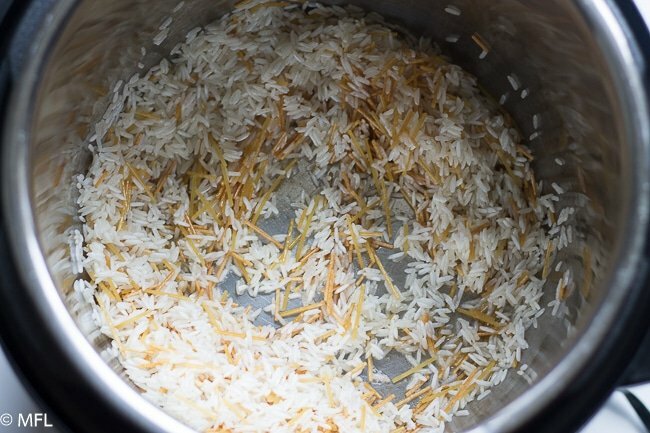 I tend to walk away and forget to lower the stove when it comes to stove top rice. 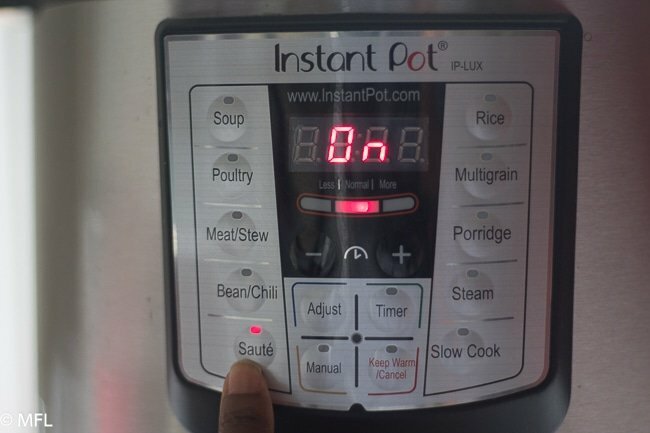 The pressure cooker allows me to place my ingredients in the pot, set my timer, and go on to the rest of my meal. Perfection and no more burned rice bottom. The great thing about this rice a roni is that you can prep the majority of the ingredients ahead of time. No need for a rice a roni seasoning packet when all the dry herbs and spices are in your cupboard. The only herb in this recipe that isn’t dried is the parsley. 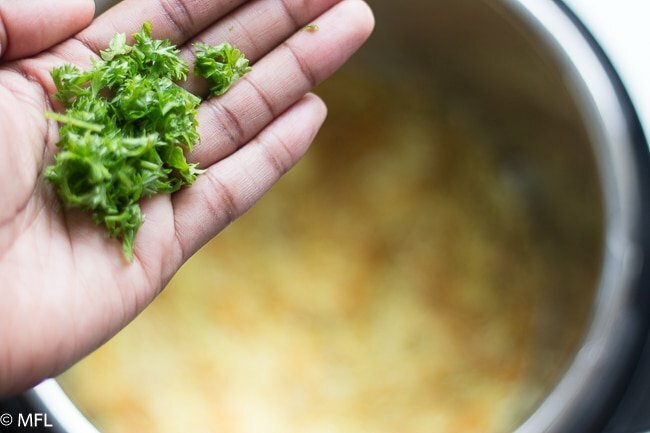 Dry parsley can be substituted but fresh parsley is so much better. 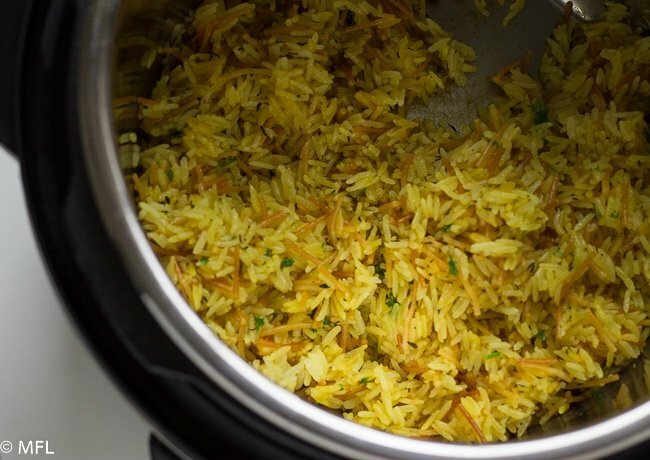 Looking for more Instant Pot recipes with rice? Try my Pressure Cooker Shrimp Paella or my Instant Pot Chicken and Rice (Halal Cart Copycat). Or Find All of My Pressure Cooker Recipes Here. 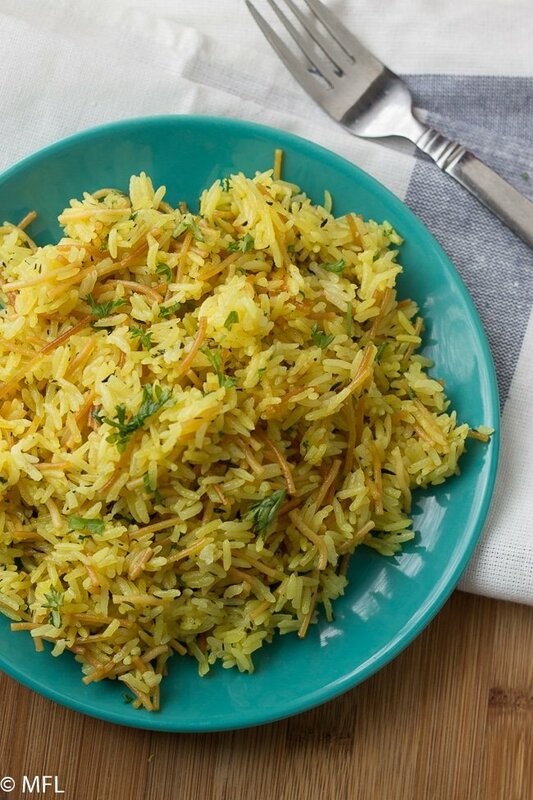 Copycat Rice a Roni is the perfect side dish for your dinner table. 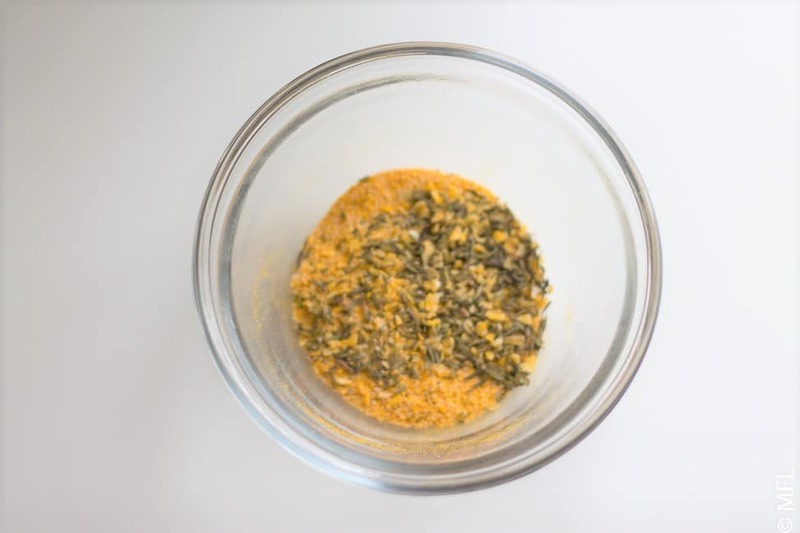 Combine dry thyme, minced dry onion, garlic powder, salt, and turmeric. Set aside. Set pressure cooker to sauté. Once Hot, add butter and let melt. 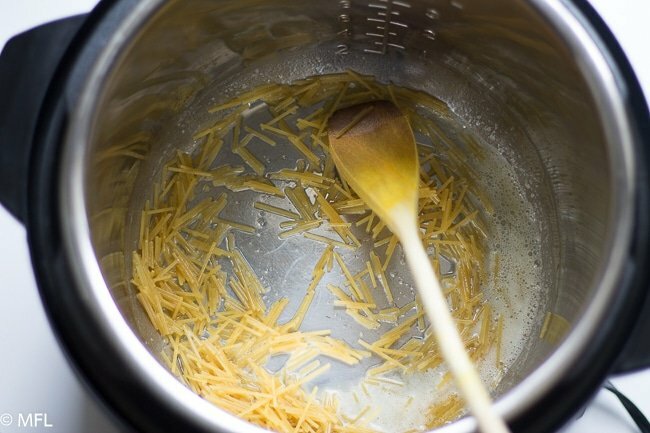 Once melted, add thin spaghetti noodles and stir until toasted, about 2 minutes. Add rice and stir for about 30 seconds, until slightly toasted. Add spice mixture and chicken broth and stir, ensuring that there are no pieces stuck to the bottom. Turn off sauté mode on pressure cooker and set pressure cooker on Manual mode for 8 minutes. Cover pressure cooker, making sure valve is set to sealed. Once pressure cooking time is done, allow to natural release for 10 minutes, then quick release any remaining pressure by moving valve to "venting"
Open lid and add chopped parsley. Fluff with fork and Enjoy! Make sure there are no dry bits stuck to the bottom of the pot. This could result in that annoying "burn" signal some pressure cookers give off. 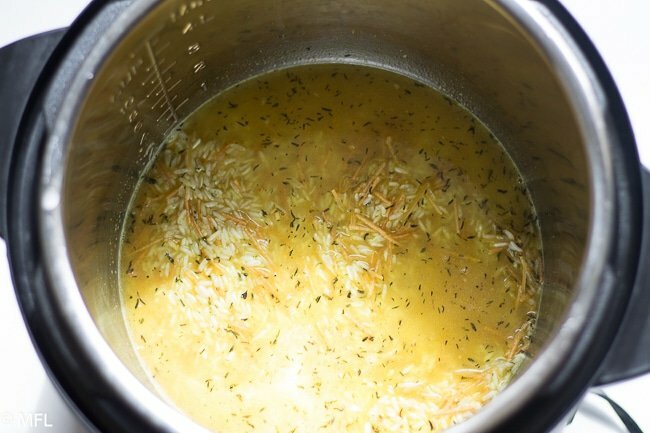 Once you add your broth, stir with a wooden spoon to ensure there is no food stuck to the bottom. 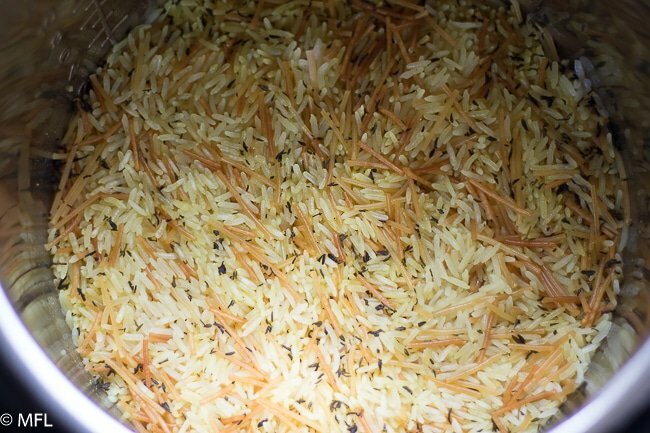 Basmati rice can be substituted for the long grain. I always rinse my rice under cold water before cooking. I started doing it out of habit because mama taught me that way. It yields a much fluffier non sticky rice. *If subbing dry for fresh parsley, reduce amount to 1 tsp. Combine dry spices and set aside. Turn on Saute mode on pressure cooker and allow to heat up. 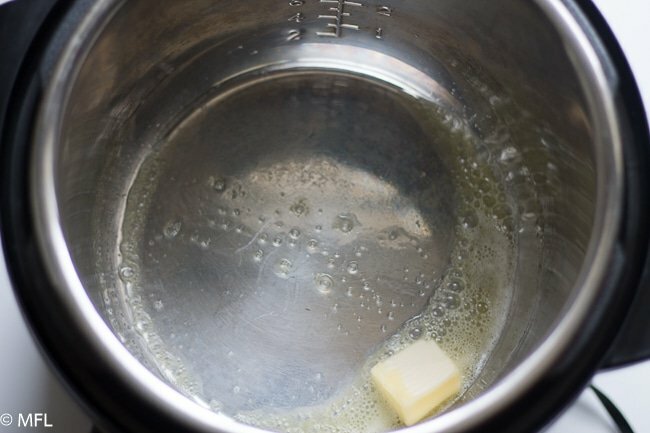 Melt butter in pressure cooker. Add noodles to pressure cooker and stir until lightly toasted, about 2 minutes. Add rice and stir for about 30 seconds to coat with butter. Add spices and chicken broth to pressure cooker. Stir to ensure nothing is sticking to the bottom. 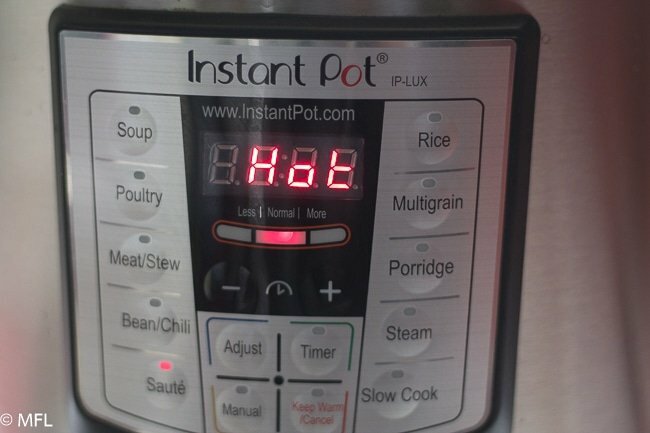 Cover and set Instant Pot for 8 minutes on manual mode with valve in sealing position. After timer goes off, allow to natural release for 10 minutes, then quick release and open. Add fresh parsley and fluff with fork. Thank you for sharing your recipe. This was absolutely delicious. I wouldn’t change a thing! This recipe will be a regular in our house. Thank you so much for letting me know 🙂 So glad you liked it. I made this last night but after I poured the rice in I realized I didn’t rinse it first. The Insta pot gave me the BURN warning. When I lifted the lid the rice and pasta was stuck to the bottom of the pan but I was able to save it by adding a little water to the pot and using the plastic spoon scraping the bits off the bottom. I did use vegetable broth because that was what I had on hand. I added some cooked frozen peas and some cooked chicken I made in the Insta Pot the night before. It was very tasty just like Rice a Roni only better! Your recipe was delicious! I doubled the recipe and added medium cooked shrimp when the 10 minutes was done. Let sit with the cover on for another 5 minutes. I will make this often. Thank you for the recipe. Add this recipe to one of my favorites. Such a reminder of my youth. I had to add some extra broth and water to reach the desirable texture I prefer but all in all a hit with me. How awesome! Thanks for letting me know and providing the feedback about the extra broth and water. This was reminiscent of my childhood and welcome since I no longer use boxed mixes. I didn’t have spaghetti, but orzo was a great substitute. Thanks for figuring out the copycat recipe that was elusive for me. Could I do this in a beef flavor by just subbing beef broth? Or do I need to adjust the spices also? Hi Linda, I haven’t tried it with beef broth so I couldn’t 100% tell you how it would turn out. However, I don’t see why it wouldn’t work. If it were me, I’d keep the spices the same. Thanks, I love the old rice a roni stroganoff recipe using beef rice a roni. Looking for lower sodium than the original, which by using low sodium broth I should accomplish. Thanks. If I try this out I will let you know. This recipe was so delicious! Thank you so much for sharing it with the world. 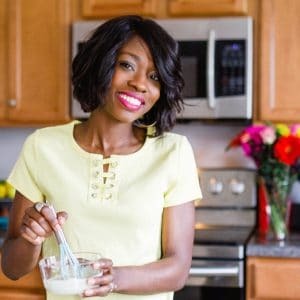 I have one question–can you double the recipe? Thanks!